HomeCivicsWhat is the Electoral College? Every four years, citizens of the United States go to their local polling station and cast their vote for President. Technically, these citizens are actually electing representatives known as “electors” who [almost] always pledge their electoral vote in accordance with how their state votes. These electors comprise the United States Electoral College, the institution responsible for electing the President and Vice President. There are a total of 538 electors, who are distributed among all 50 states based on the number of Congressional members each state has. For example, 38 members of Congress are from Texas (36 Representatives and 2 Senators); therefore, Texas has 38 electoral votes. Additionally, the District of Columbia has three electors, which they are granted by the 23rd Amendment which entitles the District of Columbia to the same number of electors as the least populous state in the United States. All in all, there are 538 electoral votes and a Presidential candidate needs a 270 electoral votes to win the election. How Does the Electoral College Work? You fulfilled your civic duty and participated in a democratic election. But how significant is your vote in the grand scheme of Presidential election? Unfortunately, not very. 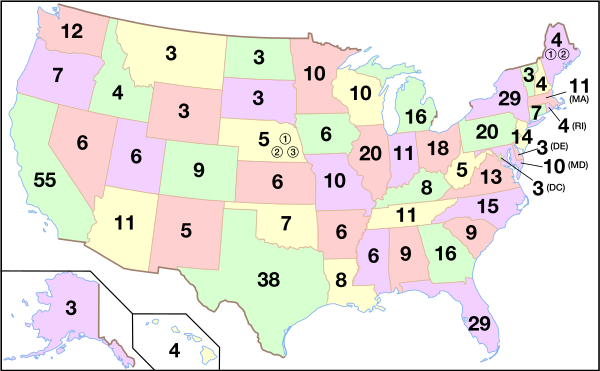 48 states and the District of Columbia have a winner-take-all format, where the candidate who gets the majority of the vote gets all of the electoral votes. So if Candidate A gets 60% of the vote while candidate B gets 40% of the vote, Candidate A gets 100% of the electoral votes. Now you’re probably saying to yourself, “Well that’s not fair!” And that’s understandable. The lack of proportional representation that results from the Electoral College frustrates many Americans. In fact, most Americans would vote for doing away with the Electoral College. Maine and Nebraska have an arguably more representative system. Both Maine and Nebraska allocate 2 electoral votes to the winner of the state’s popular vote and 1 electoral vote to the winner of each of the state’s Congressional districts. For example, Candidate A could lose the popular vote in Maine as a whole, but win the popular vote in one of Maine’s Congressional districts. In this scenario, Candidate A would get 1 electoral vote. What Happens if Neither Candidate Receives 270 Electoral Votes? Scenario A: Both candidates receive exactly 269 electoral votes. Scenario B: A third party candidate wins at least one state, preventing the major party candidates from surpassing the 270 electoral vote threshold. — In the event that no candidate reaches 270 electoral votes, the House of Representatives elects the President from the 3 Presidential candidates who received the most electoral votes. How do you feel about the Electoral College? Now that you know more about the Electoral College, let me know what you think about our electoral system by leaving a comment down below!